Pollutants affect our health. Indoor pollution ranks among the top 5 U.S. health problems. A major source of indoor air pollution comes from a dirty duct system. Every time the heating or cooling system runs, airborne contaminates such as particles of dust, pollen and other debris are pulled into the ducts. Over time, contamination builds up inside the ductwork, creating an ideal breeding ground for bacteria, mold, fungi and other microbes. Recent studies discovered that 19 out of 20 homes had considerably more polluted air than outside. The EPA states that indoor air is up to 100 times more polluted than outdoor air; now consider that according to the American Lung Association most people spend 90% of their time indoors. They also state that 160 million Americans breathe unhealthy air. Hot or damp cloths at the end of the cycle? Unusual noises? Louder than usual? Automatic sensor failing to shut off? Failure of heat element, motor or bearings? If you answered YES to any of these, then your dryer may be failing due to improper venting or clogging. 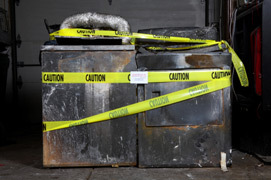 This increases energy consumption since the dryer has to run longer to dry your clothes and can also cause fires in the dryer or the dryer duct. The Product EnviroCon is specific to the HVAC industry because it is highly efficient in eliminating odor causing microorganisms along with those associated with mildew, mold and bacterial growth. EnviroCon does not use perfumes or masking agents. It destroys organisms at their origin through a chlorine dioxide release-process. In doing so, EnviroCon is eliminating odors at their source. Once a Duct System has been cleaned, EnviroCon is applied with a hand held fogger. This method makes it possible to apply to all HVAC systems including residential, commercial, industrial and institutional. Subsequent maintenance applications of EnviroCon every 6 months do not require a duct cleaning unless the condition of the ductwork warrants it. The Air QC® Electrostatic Filter filters the air far more efficiently than the more cheaply made, disposable filters commonly found in homes. Electrostatic filters remove up to 95% of airborne contaminates and come with a lifetime warranty. The Electrostatic Air Filter traps most allergy causing pollutants and disease that you breath such as DUST, MOLD, ANIMAL HAIR, PLANT SPORES, POLLEN, FABRIC LINT, SMOKE, ARESOL SPRAYS, BACTERIA & MITES. Each Electrostatic Air Filter is custom built to properly fit your exact system. Each filter has 1” thick electrostatic polypropylene mesh and polyester media which is what provides you with clean breathable air. This media is covered by a galvanized wire mesh screening and then framed in aluminum with mitered and screwed corners. The Rotobrush® is a patented machine specifically designed for air duct cleaning. It is the only machine that uses power brushes and vacuums at the same time. A rotary-driven, high strength cable runs through a double lined vacuum hose which is connected to a brush. Dual vacuums provide a HEPA-filtered suction, which extracts any debris that has been loosened by the rotating brush. The powerful yet flexible Rotobrush® easily cleans all types of air duct construction. (i.e. flex duct, round metal ducts, square metal ducts, fiberboard) including right angle turns, reducers and multiple bends found in most duct systems. The Rotobrush® is the leading residential air duct system cleaning equipment on the market. 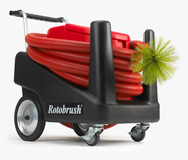 There are more Rotobrush® machines cleaning residential systems than any other brand of equipment. Seeing is Believing!!! The Roto-Vision Video Inspection System is designed to provide instant video footage of remote locations using a tiny camera that can get into dark hidden spaces as it simultaneously illuminates the area and provides a full color digital video. Not only can the Roto-Vision be used for inspection before and after cleaning, it can be used for inspection of HVAC systems and air ducts for leaks, cracks, and contamination.